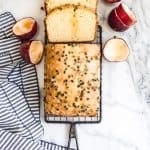 This easy Passion Fruit Lemon Loaf Cake is a moist, sweet tart quick bread that has a wonderful citrus flavor profile with a deliciously unique twist thanks to the passion fruit glaze drizzled over the top. Heat oven to 350 degrees F. Spray a loaf pan with cooking spray or line with a parchment paper sling. Whisk together the eggs, sugar, sour cream, oil, lemon zest, lemon juice, and vanilla in a large bowl. Whisk the the flour, baking powder, and salt together in a separate bowl, then add to the liquids and stir just until combined. The batter will be a bit lumpy. Pour into the prepared loaf pan, then bake for 50-55 minutes until a tester inserted into the center of the loaf comes out clean with just a few crumbs. Cool completely. While the loaf cools, make the glaze by combining the seeds from 3 passion fruit with the powdered sugar and stirring until smooth. The seeds will release their juices to make the glaze. Pour oven the lemon loaf cake and let set for 15 minutes before slicing. You can strain out the seeds from the passion fruit if you want, but they are completely edible and I think they add an interesting textural component to this passion fruit lemon loaf cake.